The Lady Bulldog softball team got its District 4-AAAAA slate back on the right track Friday at the Mack Chase Athletic Complex with a pair of decisive wins over Goddard. Following two frustrating losses Thursday against Roswell High on the road that saw the Artesia girls struggle from the plate throughout, the Lady ‘Dogs got their sticks working versus the Lady Rockets, tallying 20 total hits on the night, including a pair of home runs. 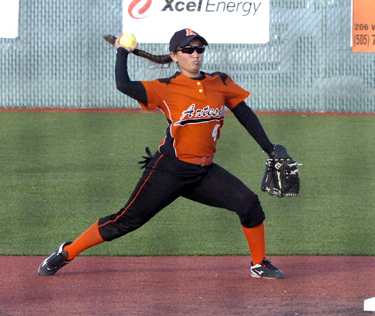 Artesia charged out to a commanding early lead in Friday’s opener, led by the first of those homers – a two-run shot by Elisa Cardenas in the Lady Bulldogs’ second at-bat of the game. From there, Cassandra Trujillo and Aubree Olguin would single and score on a pair of errors, and a passed ball made it 5-0 going into the second inning. With starting pitcher Kacey Thurman and the Lady ‘Dog defense keeping the Lady Rockets in check, Artesia picked up where it left off in the home half. Alexa Riggs beat out an infield single to lead off, and consecutive base hits by Ale Flores, Trujillo and Olguin – the first two for RBI – put the Lady Bulldogs up 8-0. A swat to left by Gracie Puentes made that 9-0 before inning’s end, putting the girls in orange one run away from an early ending. Both squads went scoreless in the third and fourth innings, and Thurman and the D seated Goddard in order in the top of the fifth. With two away, it looked as though the game might push on, but a two-base error by the Rockets plated a pair to seal the deal, 11-0. Thurman allowed just two hits in her five-inning shutout, striking out four and walking one. Trujillo was 3-3 at the plate with one RBI and Olguin 2-3. It would take the Lady Bulldogs longer to find their rhythm in the nightcap, as the team left runners stranded in their first three trips to the plate. Adrianna Baeza finally ended the drought in the bottom of four, however, with a solo bomb to center. A second run would cross in the fifth in the person of Cardenas – aboard with a double – following a single-turned-error by Trujillo, and the Lady ‘Dogs batted around to break the game wide open in the sixth. A leadoff single by Gabrielle Gomez was followed by consecutive doubles from Baeza and Madisyn Asbury, and a three-base throwing error by the Lady Rockets made it 5-0 Artesia. Riggs and Cardenas both singled in runs to keep the rally going, and another costly Goddard error saw two more across to set the final score, 9-0. Junior Shyann Spence logged the W in the circle with two hits and five strikeouts to her credit through six innings of work. McKayla Liles, on to close in the seventh, finished with zeros across the board. At the plate in Game Two, the Lady ‘Dogs were led by Cardenas, 3-4 with a double and one RBI, followed by Baeza (2-3 with a double, a homer and two RBI) and Trujillo (2-3 with one run batted in). With the wins, the Artesia girls evened their district mark at 2- 2 and improved to 10-8 on the season. The Lady Bulldogs will travel to Lovington Tuesday for a 5 and 7 p.m. double header against the Lady Wildcats before returning to The Mack Friday to kick off the second round of district play with a 5 and 7 p.m. double dip against Roswell High.